Opened in February 2015, the Cici and Hyatt Brown Museum of Art is home to the most extensive collection of Florida art in the world. The 26,000 square foot Museum features a collection of Florida themed oil and watercolor paintings dating back to the early 1800's. It is a history museum of Florida, as told through the collection of over 2,600 works of art. The design of the Museum is reminiscent of the simple, yet elegant architecture of early Florida. It was built to withstand the extreme weather conditions that occur in Central Florida, as well as sustainability for the art collection itself. Geolam, Inc. provided materials used in the construction of the Museum. Vertigo Cladding was used for the Museum’s exterior cladding. The decking was built using Geolam’s Qualita decking line. The Brise soleil was created using Geolam’s 4G Caero 10 product line. Rosewood was the chosen material color, keeping the look of the Museum as if it were built out of natural materials native to Florida. Geolam® is a sustainable wood-plastic composite used primarily for decking and cladding. Made of 90% recycled materials and 100% recyclable, Geolam is an eco friendly wood alternative and a sophisticated choice. Geolam technology reduces moisture content of wood fibers to 0%, producing a durable, slip-resistant compound protected from warping, mold, and color fading. 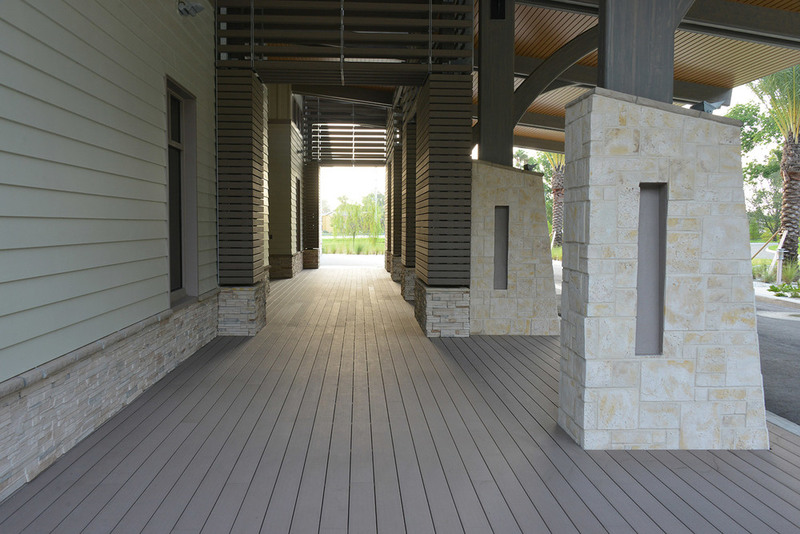 From decking, cladding, and walkways, Geolam has the perfect product for a wide variety of exterior applications in areas where lasting beauty and durability are essential. For more information, please contact John Rocco Sales.